The thing is, humans have always had a “brand.” Brand in its simplest form is what adjectives we attach to another person. Before the digital age and social media this idea of “branding” simply extended into our social realms in places like school or church or clubs. Why? Humans dig labels. It’s how we make our larger world manageable. Thus, people might be tethered to words like “band geek” “jock” “prep” “gossip” “jerk” “soccer mom” etc. As we grew older our personal brand included our occupation and this was a good way to do business. I was a member of Rotary for seven years. I was friends with “Ken the Stock Broker,” “Mike the Plastic Surgeon,” “Tom the Orthopedic Surgeon” “Debbie the Realtor” “Kim the Physical Therapist” and on and on and on. Not one of these people needed to drop a flyer in my lap when we met for lunch. I knew who they were and what they did and I relied on their “brand” when I needed their service(s). It was far preferable for me to go to Dan the Dentist (who I knew and liked from Rotary) than it was to go on-line and hope I scored a dentist I liked. But why did I “like” these people? Did I really need to get a full resume of their experience to at least give them (their services) a try? Not really. “Gene the Money Manager” was a nice family man and I enjoyed his company and that was good enough. He made the “sale” without ever “selling.” It was probably less about what he did and more what he didn’t do, but this is where we start getting into some neuroscience. Our brains are remarkable organs that have the ability to adapt to our environment. Before the invention of the written word, our memory centers were far larger because we had to pass down information orally. In fact, if you took an MRI of an tribesman from some South American tribe, his brain would look and act very different from yours or mine. Then, with the advent of the written word, our memory centers shrank but we gained even larger areas for abstract thinking. This is around the time we start seeing major explosions in science and engineering. Now we are in the Digital Age, and we’re bombarded with stimuli. Internet, television, radio, smart phones, pop-ups, etc. etc. We’ve lost our stellar memory centers and our ability to focus for long periods of time and have gained an unprecedented ability to multitask. We process massive amounts of information faster than ever before. To give you an idea of how somatic markers work, let’s do a little exercise. Is there a perfume or cologne you can smell and it instantly transports you back in time? Maybe to that first love or even *cringes* that first heartbreak? A song that makes you cry? Perhaps there is a food you once ate that made you sick and even though there is no logical reason you shouldn’t eat it now, the mere thought of eating it makes you queasy. These are somatic markers. When it comes to branding, somatic markers are king. If you are around my age or older you can remember The Pepsi Challenge. For years, Pepsi had been trying to gain an edge over Coca Cola who had dominated the soda industry for generations. So, they came up with the idea of setting up a table in stores and shopping malls and encouraging people to take a blind taste test. In a blind taste test, people preferred the taste of Pepsi. Coke was rattled by this and they did the same test and it turned out, people preferred the taste of Pepsi…and this led to brilliant ideas like “New Coke” which was one of the most epic failures in history. Coke had reformulated to make the drink sweeter. In blind taste tests, New Coke was a clear winner. So then why did it tank so badly? Years later, neuroscientists decided to see if they could demystify what happened in The Pepsi Challenge so they conducted the exact same experiment, only this time they hooked participants up to an fMRI machine so they could witness what areas of the brain lit up. So, they held the taste test the same way it was conducted in the 70s. A blind taste test and to their astonishment, people preferred the taste of Pepsi. According to the fMRI the ventral putamen, the area of the brain that tells us something tastes yummy lit up like Christmas. The scientists then decided to try something a bit different. They did the test again, only this time they told the participants what they were drinking. This time, Coke won. Ah, but something strange happened in the brain. Not only did the ventral putamen light up, but so did the prefrontal cortex, the area of the brain associated with emotion and memory. See, when it was based on taste alone, Pepsi won. But, when the brands were compared, Coke won. The human brain was in a wrestling match between two very different regions—taste and emotional. Coke had the advantage because of the vast reservoir of fond memories associated with the brand. This is why every interaction on social media matters. Right now you might not have a published novel and thus you don’t have 15 hours or more of an emotional memory to link to your name (yet). But you can get on social media and do a little bit every day. Start building your own Coca Cola experience. Every time our name floats by on Facebook, Twitter, Instagram, etc. what emotional experience are we tethering it to? There are two types of somatic markers—positive and negative. Last time I mentioned that it was possible to have a belief system without giving everyone else indigestion. I have people on Facebook who I actually agree with politically and I have had to unfriend because I don’t feel like being hysterical all the time. If I wanted doom and gloom and panic attacks I would watch the news. I don’t like feeling hopeless and powerless. I don’t enjoy being attacked. Somatic markers also have the power to give us an edge when it comes to sales. We see ads all over. More than ever before in human history. But when we have a positive experience, we notice the ad. For instance, I never realized there were so many red Hondas until I bought one. Now, I don’t believe the overall sale of red Hondas changed any, but I noticed them because I had one. Ads alone have very little power to compel a purchase. But, couple them with a brand, and the odds greatly improve. We can use some simple understanding of how the human brain works to better guide us in what we should (or should not) post on-line. Remember last time we talked about kitten memes. Don’t underestimate them. Think about it. If every time my name floats by on Facebook it is attached to something that makes you SMILE, that has an impact. We might not be aware of it, but our brain is attaching somatic markers to a name. When I see X, it is a good thing. When I see X, I want to punch things and I feel sick. At the end of the day, this is a long way to say that brands are simply what we learned in Kindergarten. Every interaction matters and it all adds up. With some planning, discipline and intent, we can better guide what it adds up to 😉 . We will talk more about simple ways to start building a brand. This can be an enjoyable experience. What are your thoughts? Do you have a perfume you used to love, but then someone you despised wore it and you no longer could stand the smell? Have you had a bad experience with a food and to this day can’t eat it? Do you think of summer vacation whenever you smell Coppertone, too? Pavlov’s conditioning vs the brain’s continual desire for novelty. People tend to choose smiles. I started building my personal brand years ago and it has definitely impacted my recent book sales. I’m an indie author and while I sell on Amazon, my biggest sales are my personal acquaintances through facebook and their friends they share me with. I’m careful with what I post and it’s worked. Thanks for your post, it reinforced my actions! Love when that happens! Something I’ve wondered about since reading your book. In it you talk about pen names diluting your brand. Now while I get that concept, for me there’s this: There are a few suitors who write in multiple genres and I tend to avoid them for one simple reason: I don’t know what a given book by then will be about. When I pick up a Michael Connelly book, I know what I’m getting. If he suddenly wrote a Stephen King-type horror novel, chances are I’d pass it up because I don’t want to read horror from Michael Connelly. I want to read a mystery. In other words, I don’t feel I can trust in getting what I want from a multi-genre author, especially when they dabble in a genre I don’t care for. I have it a lot of thought and decided to use pen names for the different genres I’m writing in. So I’d you see a Gil Miller book, it’s gonna be crime fiction. You won’t get science fiction (where I write as Scott McGregor), or fantasy (Thomas Hawk). I’m not making any effort to hide my real identity being these names, and I’m getting a website together that features all three under an umbrella brand (it would be up already if stinking Go Daddy would do their job). To me, this is still holding true to having a name associated with a certain type of writing. Or am I completely misunderstanding what you’re saying? I think you are fine so long as there is an umbrella to make life easier. It will be more work, though. And to be blunt, most people are not purists. The Digital Age has really engendered an time of eclecticism. Though this might be something that is dissatisfying to you, YOU are not necessarily your audience. For instance, it is reasonable to assume that once my fiction is published some of you will easily buy and because you trust me for good content. Just be aware that audiences don’t compartmentalize like they used to. Instead of completely different names, you might find variations of the SAME name become easier to manage. For instance Kristen Lamb for my social media and non-fiction and KR Lamb for fiction. Still making my life easier without fracturing into total multi personality. Just keep your finger on the pulse of it. Pen names are going to increase YOUR work load. If it works out, GREAT! If not, try my suggestion. “In other words, I don’t feel I can trust in getting what I want from a multi-genre author, especially when they dabble in a genre I don’t care for. I wonder if you realize that you’re practicing the very thing that you say you don’t trust. Cognitive dissonance? Stephen King made his name on ‘horror’, but his themes (people and their motives and actions are the scariest monsters of all) remain constant no matter where on the spectrum of ‘speculative fiction’ his stories fall. The Eyes of the Dragon was pure fantasy – but it still linked to his other works by featuring a character that has shown up time and again in his books: Flagg. There is a lot of crossover in genre that did not exist before. Trad publishers kept things segregated (or unpublished) because they didn’t know how to market them. If something didn’t fit into one of their neat categories, they passed it by. 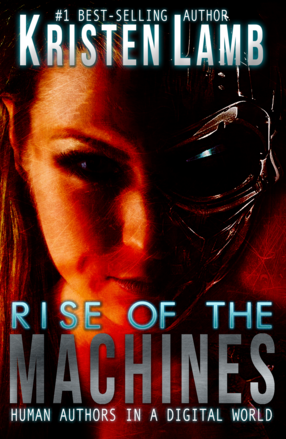 Now, with self publishing (and the word-of-mouth marketing that Kristen details in Rise of the Machines), anything is possible. Excellent post, Kristen. I never tire of reading about this stuff. It’s all fascinating. Kristen, thank you for another excellent post. Hope you have a wonderful weekend. Coppertone definitely. Good piece. Reminds you to think twice before posting crap. This was great. I’ve been trying to keep my branding linked to love and car/trailer nostalgia on my author page for “Mint Condition,” a romantic suspense with a classic Cadillac in the mix. I also noticed I got more “likes” and comments when I posted something with a furry animal. On my other book page I post more leaning toward caring for others and reading/writing with children, as that book is different genre (women’s fiction about unconditional love/battle between and estranged mother and daughter and dementia). I’ve also been staying away from politics even on my regular page, just because I don’t want the negative, combative banter linked to my books. And, I had to unfriend some folks as you said, because it just got to be too much. Another fantastic post, Kristen! I love your discussion about somatic markers. I understand how it would apply to my Facebook friends. Does it also apply to posting comments on a large website (CNN, Fox News, etc.)? If you regret some of the comments that you’ve made in the past (political rants, etc. ), it is possible to undo any harm to your “brand?” I haven’t published a book yet, but I wanted to lay the track down for my “brand” before I publish anything. Thank you! Another awesome post by Kristen Lamb on building a marketing platform. She discussed creating positive associations with your name to support your author’s brand. Great read! A must-read, especially if you hate the concept of “branding” as an author. Ho hum, did you spy on me while reading last night? I just passed the 20% marker in your book, which talks specifically about this post. I’m loving your book so far. Even though I have a Master’s in writing and have learned a lot from my mistakes with publishing four books on my own, you’re filling in all the gaps for me. Thank you! I’ll be recommending this book to my MFA program after I finish it. This is a hugely helpful dose of reality for a lot of aspiring authors who still view their books as their babies, instead of their product. So much to work on. Branding has definitely been on my mind this year, reading so much about it. But I have 7 books out that are all already different, completely so am trying to think up more about how I can brand. Great post! Kristen, this is consistently one of the best, most practical writing blogs out there, but today there’s a little magic that exploded all over my mind when I read this. You know your stuff. That’s rare. We don’t take it for granted, believe me. I’ve read your book (great help to me, by the way) and promised myself to do more on Facebook, get a webpage built, etc., but life gets in the way. It’s good to have a little reminder once in awhile. Thanks! Always love your words! Let’s go October! My somatic marker is the smell of crayons. It brings back the rich, scared-silly excitement of my first day of school. I felt like a big shot with my box of double row of colors and they were all mine. Ok, if I like Coke because Pepsi is too sweet, am I over commercialized or hard wired to pick the non obvious choice? I believe the power of consciousness and the idea we are predisposed to pick what we know. I guess I see in responses that people expect my stories to twist, my pictures to be large scale landscape. If I do A, the results are good. If I do B, a different set of responses from non standard people come out. If I go to C, I get no responses. The equivalent of always post puppies and kittens get a million likes. But substance is a moody mistress. Nah, we can post substance without it being negative. For instance, I have friends who are vegans. I would LOVE to be a vegan namely because I am not a huge fan of meat. BUT I am deathly allergic to most legumes and nuts and am also allergic to gluten, dairy and soy. This means I cannot get enough protein without eating some meat. I do not need someone calling me a murderer on my Facebook page and posting articles of abused chickens on my timeline when I mention I am roasting chicken for dinner. And YES, that has happened. Be a vegan. Post pro-vegan. If we are not vegans we will ignore or, since we are not being attacked, we might even be open to the idea of becoming vegans. Posting pictures of abused animals and calling others murderers is not the best approach, especially if our brand is an author and not as the spokesperson for PETA ;). Interesting comparison. Animal welfare doesn’t lend itself to tolerance. This is fantastic, you’re exactly what I’ve been looking for for a long time. As a former teacher I’m trained in psychology, a field which I’ve had to deal with all my life through my mother. Many books of research prove that you are right in absolutely every point. I don’t think you really need my endorsement here, but still – I totally support every word. I think you’ve nailed it with branding and Facebook. If you like the posts of certain authors you are more likely to notice their ad and buy their books. So True. Pepsi reminds me of my dad; Coke reminds me of relaxing and hanging out with my friends. It’s weird that I don’t really know how either tastes, but I do have a strong response to thinking about both. Thanks so much for this post on somatic markers. it really is a huge help as I try to get my (older but still youthful!) head around social media and modern technology. Thanks! And thanks so much for your insights about social media. I am the classic lurker, but you’ve been teaching me to step up and join the conversation. And to blog more regularly. You’re right about that too. It does get easier when I keep doing it. Hey, I put a link to Rise of the Machines on my blog today (at the end of an article about demographics–it’s a prompt from a daily blog challenge, not a topic I’d tackle on my own!). A Facebook friend noticed it, clicked through, and bought your book. On my recommendation, imagine that. Hooray! Wow! That is so cool! Thank you ((HUGS)). Another really useful post Kristen. Your brand is definitely firmly entrenched in my emotional brain. This is an incredibly useful post, Kristen! Keep sharing the knowledge! That was a great post. What’s great is that you took something complicated and told it so simply that even me (13 year old) could understand. I guess you can interact with more people via blogs or perhaps Facebook, more people you reach, more likely they will buy your book because they know you. Is writing a blog a good idea? How’d you know people would read Your blog when there are thousands out there? P.S. Hope I get picked! Yes, I believe a blog is a good idea because it is permanent and it plays to a writer’s strengths. We WRITE. And yes there are thousands of blogs out there but most people quit. They don’t keep blogging no matter what. I blogged a year and a half every week before more than 20 people cared. I have almost 900 posts. That is what makes the difference 😉 . Thanks so much for yet another fantastic and very useful post, Kristen! I’m an ex-opera singer and newbie author and have just today discovered your blog – soooooo glad that I found you so early in what I hope will be my new career! I had NO idea about building a brand this way, but it all makes perfect sense and I can’t wait to get started! Bought your book too! 🙂 Loving the idea of your October competition too as I’m just writing my next novel. I discovered the flavor behind all that cough syrup I was given as a kid when I was once offered some coffe with raspberry creamer. Never ate raspberries down here in Mississippi; had no idea how they tasted. Almost spit it across the room, and I get nauseous now thinking of it. My good old cough syrup was a raspberry taste-alike, and it definitely left a marker. I know we can’t be so meek that our thoughts never make anyone uncomfortable; but lack of balance, failure to recognize life’s not all confrontation, can surely bring about some avoidance behaviors on the part of readers. Great reminder! I totally agree with you about which friends I like to hang out with. I have one who is all doom and gloom. I feel it is an obligation to contact him every so often, but–boy–do I not enjoy it. I have another who will talk to me about X-Men and Star Wars. He doesn’t watch the news and is therefore a happy person. I crave his attention. Great post. You are a gem in so many ways. Love your work. Wow. I do agree with you…. Why is this so hard to DO? I keep thinking that if there’d been more doom and gloom on 9/11 awhile back, many more people would have escaped…. Maybe I should write political books? Or is it okay to post only the most important warnings? Or are we not really in a handbasket? Or do we just pretend all is okay? Balance is key. I think of the people I’ve unfollowed and it wasn’t a post here and there that make me cut ties. Just like we don’t expect our friends to be Pod People. We know they have bad days, misbehaving kids, feel under the weather, have trouble at work or don’t get along with a spouse. We know this and are okay with it…to a point. When they get toxic, that’s when we silently bail. I’d been meaning to get your book and I finally did. Thanks to you being you, it’s an enjoyable as well as incredibly helpful read. I need to hear this over and over because the temptation to just wack out a few tweets about one of my books every now and then is sometimes so very strong that I do it. You’ve inspired me to do some Twitter housekeeping – updating my private list of people who actually talk to me on Twitter or whose content I don’t want to miss. When you do that, you realise how true everything you say is. Who went from the list first? The authors who only tweeted about their books. I think it would be helpful for authors to consider how what they do looks from a followers POV. Have a look at your Twitter home page and see what you’ve Tweeted recently. What does it say about you? You might be embarrased. I love it when someone can explain a complex concept in very simple terms – well done on that, and thank you for what is very useful insight ??? People find that first sip of me delightful. But a whole can (i.e. book) of me, hmm, back to Coke Classic (Tom Clancy, Stephen King, etc. ), eh? As always you grab my attention just when I need your wisdom most. I’m in the process of totally changing my brand. I’ve even come up with a fun new pen name. I’m very excited to hit the internet running this time. Thank you for ALLLLL your teachings. Your words and wisdom are gold! When I graduated from high school, a family friend gave me a Coach purse. As the elder daughter in a regular middle class family I’d never shopped for a luxury brand before and didn’t know anything about Coach. I took the purse back to the store because it wasn’t my style and decided to exchange it for something else. When my mom and I walked into the store and started looking at the prices, I’m sure our eyeballs popped out of our heads. Our friend had spent THIS much? On a purse?! I found another purse in the store I liked better, and today even though I own a couple of purses from even more high-end names whenever I see that purse in the closet or see someone else carry a Coach purse I get a little zip down my spine that I own one. That strong association connected to my very first interaction with a name brand still stays with me, even today. I enjoyed reading your post. I wasn’t quite clear on branding before, but you have defined it very well in a way that makes it easy to understand. First of all, thank you so much for providing such a great learning platform for a newbie, and wanna-be writers like myself. This article was extremely helpful and comforting, too. Social media has been a steep learning curve and I need all the help I can get. I read every one of your posts, usually two or three times. oo. This is good stuff. Just when I need it too. You have done an excellent job of breaking this topic down into little Jessie bites. And to answer your question: castor oil. I can’t even stand the scent of flaxseed oil or any other oil that remotely smells like castor oil. No explanation needed. Valuable information as always Kristen! Sometimes I need these reminders so I can remember why I keep doing what I’m doing – posting on Twitter and Facebook, which can feel like a bottomless ether…! It’s like driving coast to coast. We don’t have to see a thousand miles away, only to the end of our headlights 😉 . Wise words and wonderful advice for all authors, no matter what stage of their career they’re at.